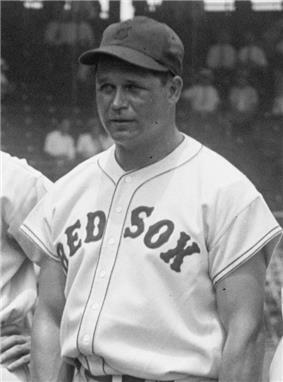 James Emory "Jimmie" Foxx (October 22, 1907 – July 21, 1967), nicknamed "Double X" and "The Beast", was an American baseball first baseman who played 20 seasons in Major League Baseball for four different teams. His most productive years were with the Philadelphia Athletics and the Boston Red Sox, where he was a formidable power hitter, hitting 30 or more home runs in 12 consecutive seasons and driving in more than 100 runs in 13 consecutive years. Foxx became the second player in Major League Baseball history to hit 500 career home runs, after Babe Ruth. Attaining that plateau at age 32 years 336 days, he held the record for youngest to reach 500 for sixty-eight years, until superseded by Alex Rodriguez in 2007. His three career Most Valuable Player awards are tied for second all-time. Foxx was inducted to the National Baseball Hall of Fame in 1951. Foxx was born in Sudlersville, Maryland on October 22, 1907 to Dell and Mattie Foxx, who were farmers. Dell Foxx had played baseball for a town team when he was younger. Jimmie Foxx did well in school but truly excelled in sports, particularly soccer, track, and baseball. He played all three sports at Sudlersville High School. Foxx dropped out of high school early to join a minor league team managed by former Philadelphia Athletics great Frank "Home Run" Baker. Foxx had hoped to pitch or play third base, but since the team was short on catchers, Foxx moved behind the plate. He immediately drew interest from the Athletics and New York Yankees. 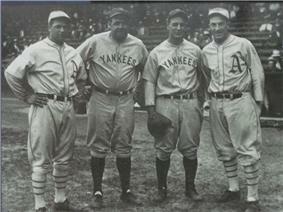 Foxx signed with the A's and made his major league debut in 1925 at age 17. 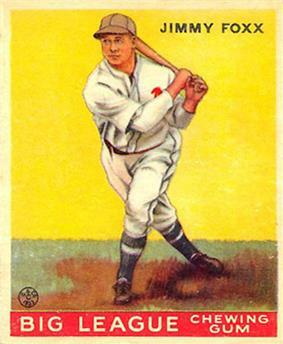 Jimmy Foxx 1933 Goudey baseball card. In 1932, Foxx hit .364, with 58 home runs with 169 RBIs, missing the Triple Crown by just three points in batting average. In a bit of trivia, Foxx had actually hit 60 home runs that year which would have tied Babe Ruth's record, but two of the home runs were hit in games that ended up being rained out, so the home runs didn't count. Boston Red Sox first baseman Dale Alexander hit .367, but in just 454 plate appearances; he would not have won the batting title under current rules, which are based upon 3.1 plate appearances per team games played. Foxx did win the Triple Crown the following season, with a batting average of .356, 163 RBIs, and 48 home runs. He won back-to-back MVP honors in 1932 and 1933. In 1937, Foxx hit a ball into the third deck of the left-field stands at Yankee Stadium in New York, a very rare feat because of the distance and the angle of the stands. Gomez was the pitcher who gave it up, and when asked how far it went, he said, "I don't know, but I do know it took somebody 45 minutes to go up there and get it back." When the Great Depression fully hit in the early 1930s, A's owner Connie Mack was unable to pay the salaries of his highly paid stars, and was obliged to sell off a number of them. After a 1936 contract dispute, Mack sold Foxx's contract to the Boston Red Sox for $150,000. 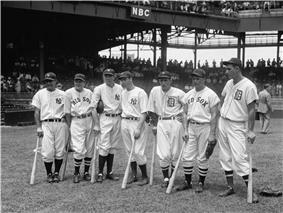 Seven of the American League's 1937 All-Star players, from left to right Lou Gehrig, Joe Cronin, Bill Dickey, Joe DiMaggio, Charlie Gehringer, Jimmie Foxx, and Hank Greenberg. All seven would eventually be elected to the Hall of Fame. He wound up his career with the Philadelphia Phillies in 1945, filling in at first and third, pinch hitting, and pitching nine games, including two as the starting pitcher. He compiled a 1–0 record and 1.59 ERA over 222⁄3 innings. Foxx was often called the right-handed Babe Ruth, but his career was the opposite of Ruth in this regard. Ruth began his big-league career as a pitcher; Foxx ended his big-league career as one. A series of bad investments left Foxx broke by 1958. He retired to suburban Cleveland in Lakewood, Ohio, and was employed by the Lakewood Recreation Department. His two children, a daughter and son also lived in Lakewood. His son, Jimmie Foxx, Jr., was an outstanding football player at Lakewood High School and at Kent State University. Foxx was honored with the naming of a city baseball field in his honor. The dedication ceremony included Foxx's son, grandchildren and several former members of the Cleveland Indians including Herb Score and Mike Hegan. TV announcer Casey Coleman, son of announcer Ken Coleman, served as master of ceremonies of the event. A plaque commemorating Foxx's community service remains there today. A statue of Foxx was erected in his hometown of Sudlersville, Maryland on October 25, 1997. In 1999, he ranked number 15 on The Sporting News‍ '​ list of the 100 Greatest Baseball Players, and was a nominee for the Major League Baseball All-Century Team. ^ "Jimmie Fox: July 29, 1929".